ROAD TOWN, Tortola, VI- Host of the television talk show Speak Your Mind, Julio S. Henry popularly known as Sam, has expressed surprised that churches have not been taking up the issue of children born in the Virgin Islands by non-nationals, which he labelled as a human rights issue. Speaking on the show aired on a local television station on December 15, 2012, Mr Henry said he believes the current system is unfair to youths. He said the churches should be pressed into lobbying for affected parents and children. “A lot of you go to these churches and these churches are not taking up your fight, you supposed to be on top of that pastor. These are human rights issues that the churches should be fighting on behalf of the people. Regardless of where you are from, if the child born in this country they belong to this country. That is my take on that,” Mr Henry stated. Mr Henry had opined that one of the things hampering the growth of the Virgin Islands (VI) right now is the “disconnect” because children who are born in the VI to parents not indigenous to the island have no identity attached to them. “…they can’t get a passport based on the British Nationality Act. What is the UK doing right now to address the situation with those kids? 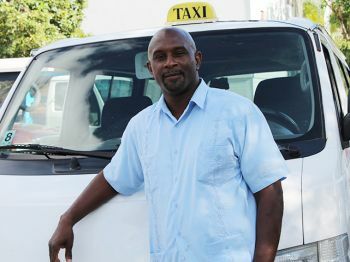 It’s a problem to a growing society like the BVI,” he stated. Premier Dr the Honourable D. Orlando Smith had also touched briefly on the issue and told reporters, “It is something that is being discussed...and it is something that we will arrive at a conclusion and make some recommendations”. The Virgin Islands takes an extremely restrictive position in relation to immigration. Even birth in the country is not sufficient to grant belongers status (unless the person is born to parents who are themselves belongers). It is possible to be naturalised after a period of long residence, but it is rare to be naturalised after less than 25 years and often much longer. Sam this is not what the men and women of God are called to do. God called them to preach the gospel that sinners could come to know Jesus Christ as their Lord. I agree that what is happen with the children is not right, but like you said it is a human rights issue. We all use the constitution when it is convinent for us. Go and search the same constitution if syou are so concern about those children and find out how you can help them on your talk show. Maybe it is time you get all the non nationals together who have children that are born in the BVI and and come up with some way to bring this matter to the Queen's attention.Sam I wonder about you sometimes! Here we go again, the "Get Sam" crew is at it again. Happy Hunting. did God personally tell u this or are u going off of ur narrow interpretation of scripture? excellent idea! I recommend it be done 10 minutes after they become pregnant. Does that include the fathers as well? Smfh.... These fools get on the radio and tv showes in the BVI just talk cause they have a big whole in there face. We just need a amnesty on my little island,if you are not BVI lander and not working you have to leave the island. You may not like this guy, but honestly he do have good valid points. He speak about issues that is swept under the rug. Speak ur mind! that sam what a character. Why he left the US and under what circumstances? Credibility is in question. give the children born here bvi status but no UK status till they are 18 unless thier parents are from the UK or BVI. This simple solution will satisfy the UK in its position of not giving out UK passports to everyone. When people travel, relocate or go on contract work to another mans country it is their personal responsibility to acquaint themselves with the laws under which they would be living. The present situation was caused by dirty politicians who were and still are only interested in being elected. Persons born here of expats are supposed to and should claim their parent rights and unless and until both the politicians and others understand this and accept this, this situation will get worse. Up until the 80's when women got pregnant they were required to leave the Territory, some dumb politician decided to change the policy and now we are in an unacceptable position where we are out numbered by persons that can pick up and leave as they have one or two other countries they can call home. EG. Under the Laws of the United States of America no matter where you are born of their citizens that child is automatically a U. S Citizen. Only selected expats have passport for their kids that born here. Why is this so? Is this has anything to do with social inequity? Is the same with residency ,some expats here over 25 yrs and still on work permit while others resides here just ov 10 yrs and have residency. Isn't this injustice? If we are truely God fearing people living in this small community ,these things should not have happen. It's very sad. We all have to pray for equality. Never gonna happen. He makes good points - most countries (including the USA) confer citizenship on any person born there. But BVI people do not like anyone who is not from here, and they certainly are not going to give out citizenship just because you were born here. People like Mr de Castro think you should not even get it if you are born here from naturalised parents - it should only be if your parents were born here too! While I agree with Sam on many topics, however, I am against this view. The right of Jus Soli....or conferring citizenship through birth has never been mainstream since the establishment of citizenship during the Roman days. It was established by former colonies to help with migration. These countries required vast human resources to not only assist in the industrialization practices during those days....but also to help with ensuring that the ranks of militias stayed occupied. Needless to say, that was one tactic employed to get people to immigrate. Fast forwarding to today...that practice is largely unpopular with only 15% of nations still with this on the law books. Nearly all these nations are in the western hemisphere. It is rather important to note that with the insignificant exception of the US and Canada, Jus Soli has never been documented as contributing positively to the advancement of any of those states exercising it. Even using the good ole US of A as an example, while they are the poster child of such a practice.....debates have started in recent times over possibly going the route of the rest of the world....(which is the practice of Jus Sanguinis or citizenship through citizen parent(s))... as a long term means of reducing their financial obligations for programs like social security and medicaid/medicare. It is highly possible that the US will adopt this measure....through constitutional amendment....within our life times. The BVI already has a clear problem with immigration....so why would we seek to open the flood gates wider? Give the child the right of citizenship and belonger status....and their expat parents will never have the leave why? Those 2 expats who have to return home....who have a one year old child born in the BVI now have a valid claim that their child.....belonging to the BVI and being a British Citizen have the constitutional right of establishment in the BVI and removing one parent or both would deny that child the right and potentially make them a ward of the state. All we would need is but one solid case in favour of such an argument....and Pandora's box would swing wide open! In the US they call them anchor babies! Be careful what you wish for Sam! As for those implying that the UK should stop conferring citizenship on the folks of the BVI....Please, please, please understand these shores have been under British rule before the United States became independent! Generations of our forefathers worked the ground under duress, no pay and inhumane conditions....for the benefit of the United Kingdom! Yet after that we voluntarily and mutually agreed to remain part of her kingdom. That makes me just as British as any other British Citizen....be it born in London....Gibraltar or the Falklands! I am filled with Joy to see how persons express themselves and give their opinon on this matter.However,as a student of the law,I always try my best to look at the law as it relates to a matter,and then apply the facts and issues to the law:Who is deemed to BELONG to the Virgin Islands,under the V.I Constitution?The section to follow will certainly eradicate the blame-blame at the BVI and its people. Chapter 1-Interpretation 2(2) on page 6 of the V.I Constitution states "For the purposes of this Constitution,a person BELONGS TO THE VIRGIN ISLANDS,if that person-(a) is born in the Virgin Islands and at the time of the BIRTH his or her FATHER or MOTHER is or was-(1)A British Overseas Territories Citizen(or British Dependent Territories Citizen)by virtue of BIRTH,REGISTRATION, or NATURALIZATION in the Virgin Islands or by virtue of descent from a FATHER or MOTHER who was BORN in the Virgin Islands".These are the instructions of Her Majesty-The Queen,in Coucil,when she ordered the V.I Constitution,on 13th June 2007.Now,let us not forget,that in 2005,the Constitutional Commission[the persons who were on radio in the BVI etc..lobbying for this new Constitution] had the opportunity,to call on Her Majesty,to make the necessary amendment to this section of the Constitution:The government at the time chose not to,and I am sure,that there are VERY GOOD REASONS for that. I did a research on Caribbean Constitutions and other big countries,and in many other countries,the very same situation applies in other countries. [The USA seems to be the only country with the "where you is where you from concept] Rationally,it is my belief that "where you born is where you from" that is just my views,BUT the V.I.CONSTITUTION,which was ordered by Her Majesty,is advising us as BV-Islanders,that a child gets the STATUS of the parent or parents at BIRTH.So if a BELONGER/BOTC gives birth to a child outside the BVI,that child is deemed to belong to the BVI,or if the father is from the BVI,and he fathers a child born outside the BVI from a none-belonger mother,that child is deemed to Belong to the BVI,BUT if a none-belonger-mother gives birth to a child in the BVI,and the father is not a belonger,that child is also NOT a belonger!If the father is belonger,then that gets the father's status,and hence the child id a belonger. This issue on a whole is a Constitutional issue:So we cannot call on the churches or even the politicians to comment on this matter;It is a matter for public petition to Her Majesty,the Queen,to Amend the Constitution,to remove this clause.Until then,that is the law of the land.It is a Constitutional matter.It is not a domestic matter.Vino,thanks for allowing the legal team,to enlight the public on the LAW relating to this matter.God bless VINO.